Eat First, Think Later. 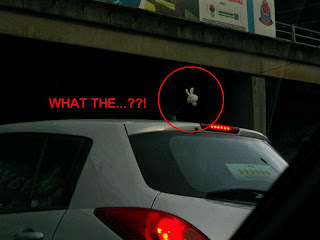 : Strange driver, strange car "Decoration"
WHY ON EARTH do people "cucuk" a bunny on to their receiver?!! Weird lar these people. LOL!! You should see how the Americans decorate their car. When I was in Texas in 2006, I saw a pickup truck with what looked like human balls hanging at the rear bumper. And there was another car which had an effigy of Osama bin Laden, hanging by the neck, on the front grille. Btw have you read my latest post? it is special in m'sia but not in oversea...>.<"
Happy CNY to you too.